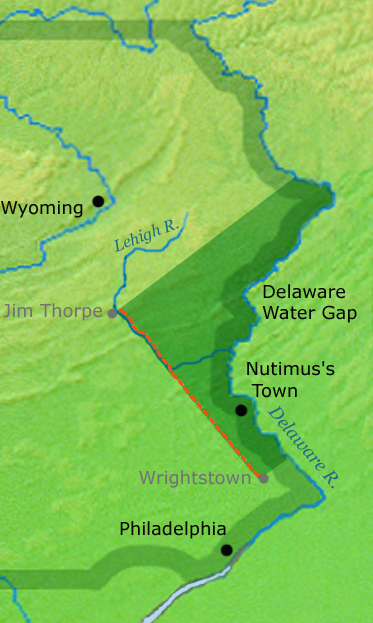 When the Pennsylvania surveyors of the Walking Purchase recorded the area where the final “walker” stopped, near modern-day Jim Thorpe, they extended the boundary line northeast to the confluence of the Delaware and Lackawaxen Rivers. This action doubled the total acreage of the Walking Purchase and went well beyond the initial territory the Delaware Indians thought they were giving away. The area bounded by the dark-green wedge in this modern map of Pennsylvania shows the total territory that was claimed by Thomas Penn, John Penn, and James Logan through the Walking Purchase. 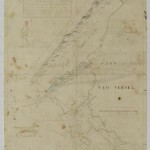 Nutimus, leader of the Delawares, and other representatives of the Delawares thought the Pennsylvania settlers were only going to claim land south of Tohickon Creek (near the Nutimus’s Town dot on this map). The extensive border of the Walking Purchase ended up forcing Delawares away from eastern Pennsylvania and farther to the west. Posted by Joshua Lisowski on December 18, 2014 at 4:11 pm. Bookmark the permalink. Follow any comments here with the RSS feed for this post. Post a comment or leave a trackback: Trackback URL.